Once upon a time, after the holidays, three girls chatted and found out that they were all stressed out. One girl was addicted to work, the second was addicted to food, and the third was obsessed with exercise. On a sudden whim, the three girls all decided to meet up and go to the mall. 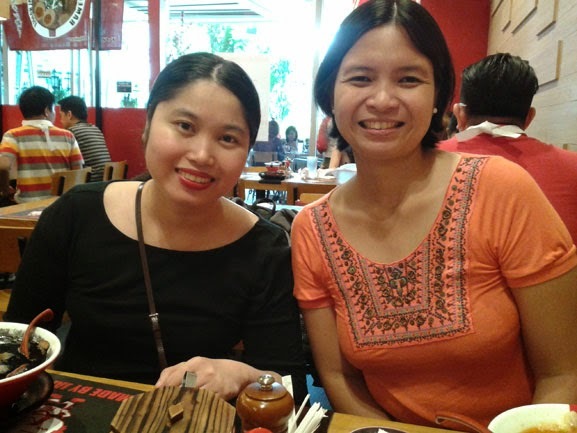 A snapshot of my foodie buddies before we dug into our ramens. The three girls wanted to go somewhere new but close to their homes and they were all craving for Japanese food. So the three girls ended up at Robinson's Magnolia to look for Japanese food. 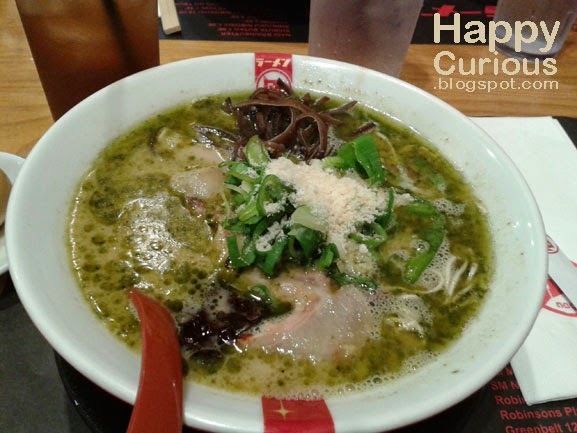 Our first stop was to try out some Japanese comfort food and so we had to check out Ramen Nagi, which has had a lot of buzz from authentic Japanese food lovers, especially ramen lovers. We are not experts on ramen or Japanese food but we do have an appreciation for delicious and hearty food including ramen. 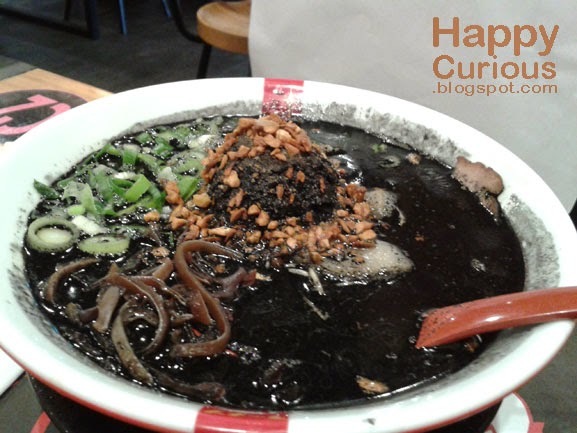 Since we still had our individual tastes, we ended up ordering one each from their Butao King menu: Black King (with squid ink in the broth), Red King (with spicy, miso-based soup) and Green King (Japanese-Italian fusion with olive oil, basil and cheese). Each one priced at Php410.00 per hearty bowl. You can also order their Original King for Php390.00. The restaurant interiors had a very Japanese feel to it with thick wooden tables and stools and lots of banners with Japanese phrases on them. The red walls and banners, and the wooden furniture with the black uniform of the waiters and waitresses gave the whole place a warm and cozy ambiance. They also had some rules to preserve the authentic taste of their food. There was no takeout order. If you can't finish your ramen, you can't take it home with you to finish it later. I also noticed that the ramen orders were assembled only when a customer orders one so the ingredients are fresh and the broth is just hot enough and not scalding hot. For ordering, we were provided with a list where we could check the options we want for our ramen including the level of spiciness, the kinds of toppings, etc. Once our orders were taken, it wasn't long before our ramen's arrived. 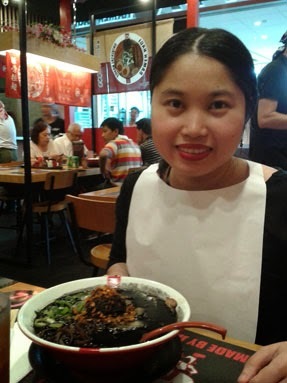 Customers are also provided a big, paper bib so as not to soil their clothes while slurping soup. Thus, Tyn has hers on in the picture above. We sampled a taste of each other's order too and we all agree that all of them were delicious while tasting very different from each other. The Black King Ramen had a thicker consistency than the other two. The texture was a bit grainy as well but it was flavorful and the texture did not distract one from the taste. Much like eating Dinuguan but with a much finer texture. The Red King Ramen was smooth in texture with a kick of spiciness. It also had prawns so it had the distinct flavor of seafood. Our first thought was that it tasted like the big noodle cups that came from Japan with the big shrimp inside. The Green King Ramen was creamy and surprised my taste buds with the salty flavor of cheese and the smell of basil. It sounds weird but I think the fusion of Japanese and Italian in this one is just right. I thought of it as Sopas but with ramen noodles instead of macaroni pasta. This is my personal favorite among the three. The noodles were firm and chewy and the toppings were soft and contributed their own distinct flavors too. We are trying to compare flavors with the local dishes we've tasted but the depth of flavors of these three are really something entirely different and is something you have to taste for yourself. Let's just say the flavor comparisons we thought of were just our first impressions; like the first note in a perfume's layer of scents. 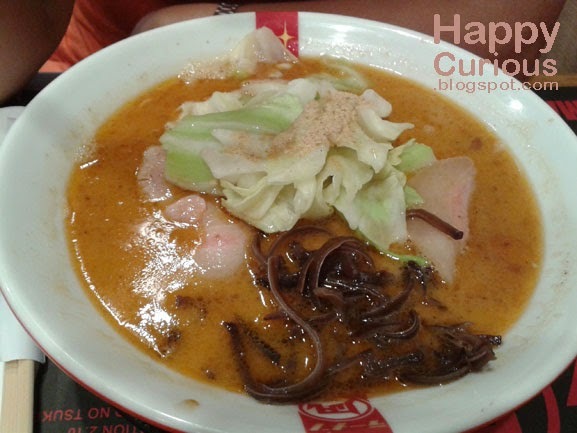 This hearty ramen trio is a good way to satisfy your ramen cravings as they were very delicious and the portion sizes are very filling for the price. Because the ramen was so filling, we decided to go around the mall a bit and window shop. This little food trip has now caused us to crave for ramen even more (and Japanese food in general). So now, we are always on the lookout for new ramen places to eat at. 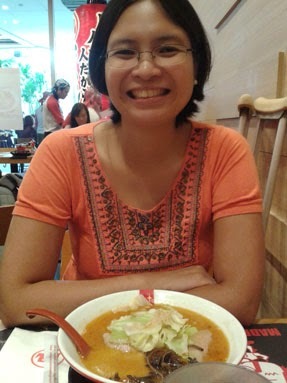 We hope to satisfy our ramen cravings again on our next ramen adventure.